A high added value of clear ink is the "advantage"
Clear ink can be used to improve designs by adding a gloss to printed media. In spite of the advantages of clear ink, a problem that remains is that dust in the workplace can come in contact with the printed media before the ink cures, which may thus spoil the product. 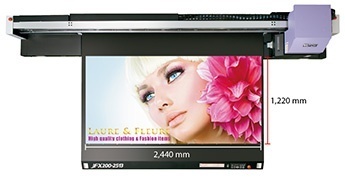 The MCC (Mimaki Clear Control) mounted on JFX200-2513 minimizes the ink-curing time to reduce the possibility of dust accumulating on the printed surface. This is accomplished by simultaneous clear ink jetting and UV light radiation, thus producing a glossy clear print with minimum dust. Clear ink can be applied to only a part of the design or to the entire design to provide a high-value-added finish. In addition, simultaneous printing of clear and colored inks can add value while maintaining the same productivity obtained in color and white two-layer printing. Partial glossy printing can add eye-catching effects to high-quality designs. 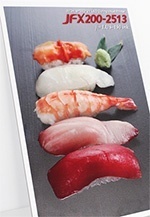 For example, the freshness of food can be expressed as shown in the picture on the right. The use of clear ink alone can express the idea of superlative quality, as shown in the pictures below. Glossy printing by applying clear ink over an entire surface can convey feelings of high quality as shown in the picture. The entire glossy printing of an excellent design can be your strong advantage when producing indoor/outdoor signs that attract people's attention. 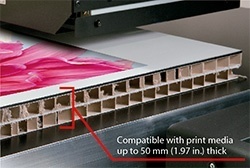 The JFX200-2513 can be used to print 4'×8' panel boards* that are commonly used in the marketplace. It comes in a compact size for easy installation and provides excellent user-friendliness with high functionality. 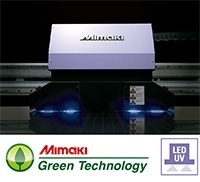 The LED-UV curing unit has an exceptionally long life with lower power consumption. With its low heat output, it can be used with print media susceptible to problems with thermal deformation or discoloration. Producing very low VOCs and very little odor, it is both environmentally friendly and user-friendly, working well in indoor applications such as restaurants. It also produces no potentially destructive ozone during the printing process, which dramatically lessens any potential load on the environment. 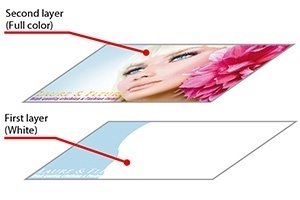 Two-layer printing of separate white and full color layers can be done simultaneously. A coating of white ink can be applied evenly at high accuracy to really bring rich and vibrant colors to life on transparent print media. Images can be printed out not only onto regular paper media, but also directly onto thick media. 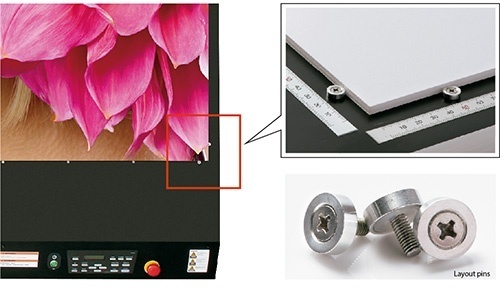 The unit prints on media up to 50 mm (1.97 in.) thick to support expansion into a wide variety of print business applications. 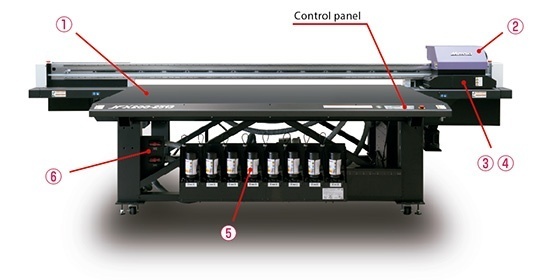 With the newly developed ink supply unit, 1-L bottles of ink can be inserted into the system and used as is. Ink bottles can be inserted quickly and easily from the front of the printer, speeding up the replacement process. The vacuum can be turned ON/OFF quite easily and quickly from the control panel. The control panel can also be used to control two separate partitions in the X-direction of the suction area. The suction valve on the front of the printer enables the area to be controlled rather easily. MAPS2(*) is equipped, in addition to the normal mask pattern, to effectively curb banding. Printing applies ink in gradations over several passes using a mask pattern and then uses UV light to harden the ink, both of which work to make banding less visible. Variable drops function provides 3 different drop sizes at once. 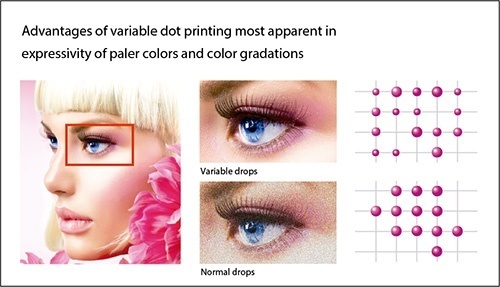 It produces smooth and natural gradation, without granular appearance, even in the 4-color mode. Users previously had to be extremely diligent in lining up the position of print media when placing it on the flatbed of the printer to ensure that the media is not tilted from the print surface and that the origin is centered correctly. This printer is now equipped with layout pins and a scale designed to help resolve these issues. The layout pins work to secure the print media in place to prevent it from shifting and the scale can be used to check the position of the print media before printer settings are made, allowing images to be printed without shifting. A gap pin in the carriage automatically measures media thickness, however, there is no need to measure thickness by a ruler or Vernier caliper. This helps to perform the job efficiently. To prevent accidents, this printer is equipped with a media jam sensor. This sensor stops operating when safety for operators is threatened, such as when the manually inputted media thickness is wrong or when the displaced media interferes with the carriage. Once operations automatically halt, the carriage can be shifted to a safe position. MCT is a standard feature included to effectively avoid the settling of white pigment in the ink lines by regularly circulating the ink. It prevents print troubles and enables stable output from the start of operation. In addition, MCT contributes to reduction of ink waste, thereby supporting environmentally and economically friendly applications. *MCT is only available for white ink. When print problems occur due to a few clogged nozzles, and the nozzle cleaning does not resolve the issue, a conventional printer would have to stop printing and wait for a service person to fix the problem. With the Nozzle Recovery Function, continuous printing is possible by recovering the image quality from a nozzle being removed or taken offline, all without slowing down the machine. *Recoverability of Nozzle Recovery Function is limited. Mimaki printers employ UV curable inks that produce very low VOCs* and no ozone. The inks also generate very little odor, making them easy on the user and environmentally friendly, without requiring separate ventilation equipment.